Remember this summer, how I pretended my piano was a mantel, and decorated it with a big ol' faux vintage door on there was one that Mr. Magpie built for me? Well, when we decided to turn the living room into a study, we created one little eeny-weeny problem. The piano has to be moved. To the family room. Which as you remember has a sheet of fabric thumb-tacked to the ceiling for a wall. So, no dice on the piano mantel. When I started, I didn't know exactly what I was going to put on here. I had a few random ideas, but mostly I just knew I wanted something that would work for Fall and Halloween, and that I couldn't spend any money, so everything had to be in my stash. Some things you may actually remember seeing before, and some you may not. But it's all stuff I had laying around for one reason or another. Did I mention that I just sort of decided to do this today, and I'm glad I went for it, because if I had thought about it, I wouldn't have? This kind of decorating scares me. (Silly, right?) 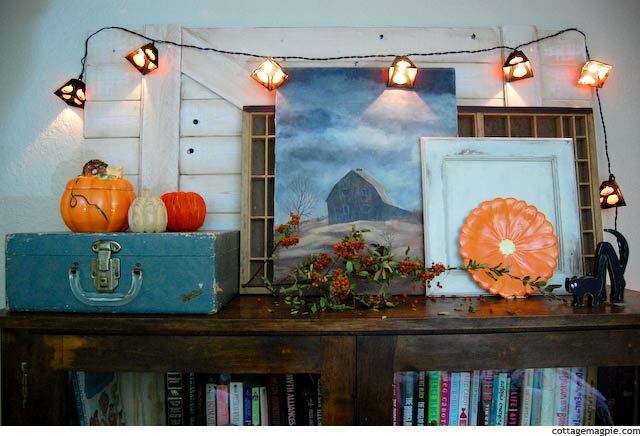 But there's so much beautiful decor out there, and other than the mantel I did on the piano this summer, I have never done this type of decorating before. I didn't think I could do it. But I really like what I came up with. I surprised myself! Of course, since it's raining here, and my bedroom has only one tiny window, I also fretted quite a bit about getting pictures. I ended up stretching myself there, too. I'll share that coming up. I also have lots more to share about how I put it all together, and what exactly is on there. 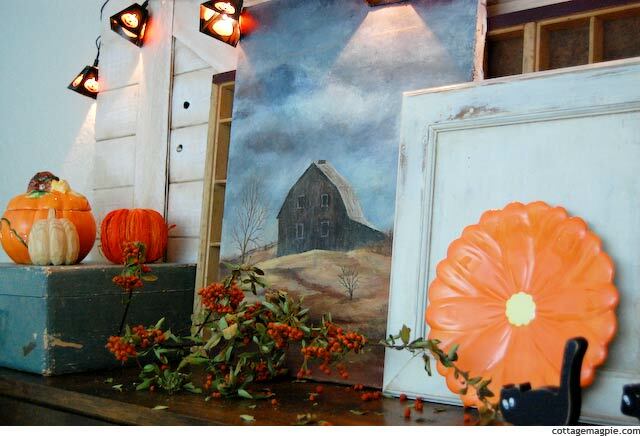 (All that is in my post "How to Decorate (ahem.. Wing) a Fall and Halloween Mantel") For now, I just wanted to say... HAPPY FALL! What about you? Have you surprised yourself lately?